A self contained 2m receiver complete with a built in variable attenuator (the black knob on the right). 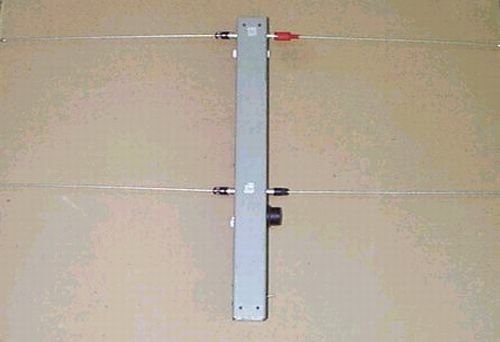 It uses a built in 2 element HB9CV antenna, has a frequency range of 144. 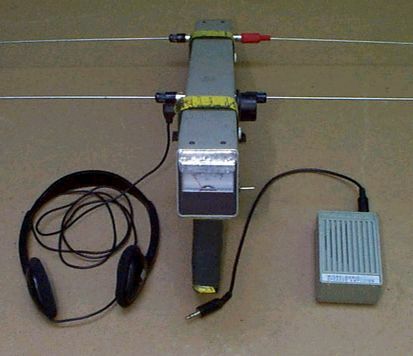 MHz - 145.99 MHz, and is tuneable in 10 Khz steps via push button BCD encoders. In addition to the external signal strength meter, the FRX-2000 uses a stereo headphone jack to provides an aural signal strength on one of the stereo channels, and receiver audio on the other. This is a very useful feature as it allows the user to listen to the transmitter audio, while at the same time allowing the hunter to determine how close they are to the transmitter by using the aural signal meter/attenuator combination. The unit has FM and AM modes which are selectable by an internal switch. I modified this unit with a pistol grip assembly and installed a LED in the signal meter for night viewing.